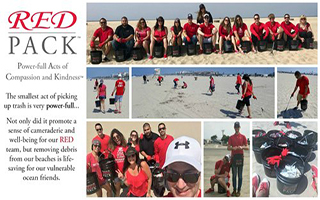 The RED team headed to the beach for our quarterly RED PACK™ initiative and corporate team building experience. What an incREDible, rewarding, and eye-opening day for everyone. To the shouted thank you’s of passing cyclists and beach-goers, we set out with our trash buckets and bright red gloves on what looked like a sea of pristine sand. To our amazement, you could not step a foot before you spotted hundreds of thousands of little pieces of debris nestled among the shells and driftwood – bottle caps, plastic zip ties, cigarette butts, Styrofoam, plastic forks/spoons, baby wipes, straws, socks, shoe laces, plastic wrap, plastic bags, wire, candy wrappers, hot sauce packets, broken toys, several unmentionables, and even an unending stream of fake rose petals and gold confetti… all very dangerous items for our ocean friends. Before our clean-up, we reviewed some of the safety issues as well as interesting facts about the debris on our beaches. Did you know that women, men, and children in the US generate 3-7 pounds of garbage per day? https://www.parks.ca.gov/pages/642/files/beach%20clean-up%20information%20letter.pdf That number equates to over 1 billion pounds of trash per day in the US alone. It is very simple to do our part. When you head to the beach, please bring reusable water bottles and a container to round up your trash. Be cognizant of your bottle caps, straws, food wrappers, etc. and how quickly the wind can whisk these items away and pose a threat to over 267 species of marine animals. This small act of cleaning up after ourselves is very power-full. Make every day a POWER-FULL ACTS OF COMPASSION AND KINDNESS™ day!